When Valery Gergiev brought the Kirov Opera to Edinburgh in the mid-1990s, audiences revelled at their encounter with the Russian vocal tradition while at the same time sniggering at the spectacularly, opulently naff production as elaborately garbed singers planted themselves amidst sumptuous but lifeless sets to deliver their lines. Though the Kirov has reverted to its pre-revolutionary identity as the Mariinsky, one of the most remarkable things about this production of Strauss's singularly ambitious opera is the way that it preserves some of that former splendour, now deployed as a resource that gives the contrast between spirit-world and human-world tremendous vehemence. Hoffmansthal's text is richly and densely allusive, as is Strauss's score,. Hoffmansthal set out with the concept of referencing Mozart's Magic Flute in a reprise of their method with Rosenkavalier: not a parody, and not a rewriting, but an evocation. It is, however, a pointed evocation, one that fundamentally shifts the balance of power away from the orderly, hierarchical precedences of Mozart's masonic vision, where Pappageno and Pappagena afford light relief. In Die Frau, we have – to put it baldly – a working-class love story. The spirit world machinations don't exactly provide light relief, but neither do they inspire awe. The Frau doesn't have a shadow because she's of the spirit world. However, she has married a mortal Emperor, and needs to acquire a shadow in order to bear children. There is rather a lot of convoluted explanation to fit into the first scene of act 1; rather than showing up in person to set things moving, Keikobad, lord of the spirit realm, sends a messenger to the Emperor's gates, where he's met by the Empress's nurse. The Emperor rises, and announces that he's off hunting. The Nurse explains the situation to the Empress, and oh dear me we're in for a long and tedious evening…. Except that, beginning with a stunning piece of projected video during the entr'acte, a powerful sense of urgency kicks the opera into life, and as the curtain rises for the second scene a staggering transformation has taken place. Instead of a gauzy mythic netherworld, we're suddenly in what looks like a launderette, realized in painstakingly shabby detail. Here, the Dyer dedicates himself to labour and dreams of filling his house with children. His wife, meanwhile, quarrels with his brothers, and dreams of a better life. The Nurse, visiting the mortal realm with the Frau, immediately recognizes an opportunity to buy the Dyer's Wife's shadow—in effect, offering her a win on the lottery—and sets the plot in motion. By the end of act II—cutting between the Dyer's cottage-works and a stunning forest represented by a single tree, part giant orchid and part bonsai—both husbands are in homicidal rages at their respective wives (something no one does better than Strauss), and it takes the third act, now in a strange realm on the one hand deep in the earth among the roots of the tree, and on the other somewhere else, wherever it is that delivery vans hang nose first, suspended in the air. (The climactic scene of Inception comes to mind.) The Empress's conscience has prevented her from going along with the Nurse's scheme to obtain the Dyer's wife's shadow. Now back in the anarchic, gossipy spirit world, a mysterious guardian hears the Empress's story, grants her a shadow and undoes Keikobad's spell to free the Emperor. The two couples are reunited, and much procreation no doubt ensues. Lighting the Empress in order that she appear shadowless is a tall order, but in the scene with the guardian, her projected shadow is most effectively realized (the stone Emperor less so). 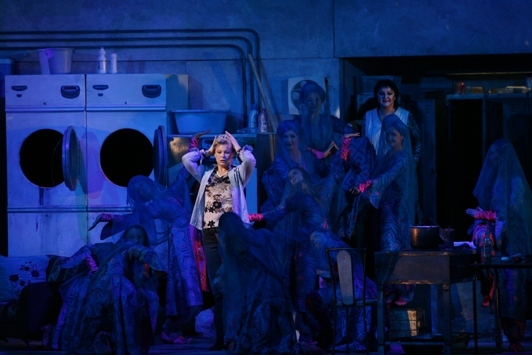 Prior to that, the most memorable piece of stagecraft was a stunning moment in Act II where the spirit-world chorus emerges sinuously from the washing machines and driers at the back of the stage. All in all, a fascinating text with much to relish. The clash between spirit and human worlds in a way represents a clash between romanticism and modernism: in its somewhat vague timeflow, its hunting and nature tropes, it remains with the romantic tradition, whereas the stress on the relationship between work and identity, the dominance of strong, emasculating women, and even the mere fact of conscience as a significant plot element, philosophical rather than pietistic in the way that it asserts resistance—these things are markers of modernity. While it isn't clear that Hoffmansthal and Strauss were entirely on the same page, the composer has framed the drama so as to leave no doubt about his sympathies. The three women dominate proceedings, and Olga Sergeyeva's Dyer's Wife most of all. A striking and vibrant presence whenever she is on stage, her formidable voice remains in focus even at the extremes of orchestral volume and texture. 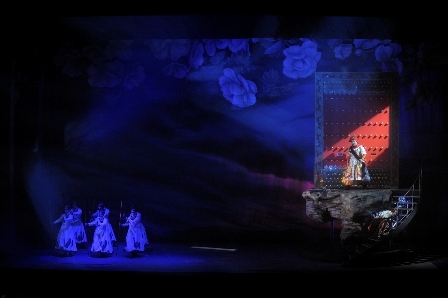 If Mlada Khudolei's Empress didn't survive such moments quite so well, she compensated with an alluring, honeyed warmth, especially in the crucial passages of act III. Olga Savova's Nurse wasn't as lively a stage presence as she needed to be, and perhaps her voice was underpowered too for this most demanding of roles, though she hit her act I dog-whistle top D immaculately. It was difficult to pay attention to Viktor Lutsiuk's colourless Emperor, except to smirk at the miserable little bow he'd been sent hunting with. As Barak the Dyer, Edem Umerov similarly had the score to contend with, and similarly struggled to assert himself as a dramatic presence, though his strong vocal performance was a measure of compensation. In the pit, a fiery orchestra under Gergiev's direction turned in a performance that was at times thrilling in its drive and electrifying in its passion, though at times also a little short of polish. At the end of the performance, Festival Director Jonathan Mills appeared onstage to announce that Valery Gergiev has agreed to become the Honorary President of the Edinburgh International Festival Society, in succession to Sir Charles Mackerras.